If your kitten’s sneeze just won’t go away, it might be a sign of something more serious. Review these symptoms. We adore kittens for their playfulness and irresistible cuteness factor, but did you know they can catch a cold? Kittens may sneeze as a normal behavior, but there are other signs that are cause for concern. Learn how to identify the symptoms of more serious conditions and when to head to the veterinarian’s office. You may be asking yourself, “Why does my kitten keep sneezing?” There are plenty of reasons, and you should pay close attention as your kitten grows. The lungs of a kitten are still in development, so respiratory problems should not be ignored. 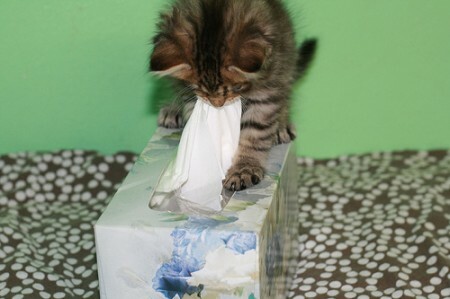 Occasional sneezing in kittens is just their bodies’ way of expelling irritants in the nasal passage much like humans. This isn’t a cause for concern. But more frequent sneezing or additional symptoms can be a sign of allergies, vaccination reactions, a cold or even a more serious infection. These additional symptoms might indicate something more serious than a typical sneeze, so plan to take your kitten to the veterinarian if you notice them. If you have recently administered a flea preventive or added a flea collar to your kitten, please check the box (and if you don’t have the box, take the collar off immediately). Certain flea medications and items can be toxic or cause an allergic reaction to your kitten. Do not use any product without making sure it is safe for your kitten’s age and weight, don’t buy or use a recently recalled item, and check with your vet. Kittens can also have reactions to vaccinations. Check for symptoms related to vaccinations and check with your vet for treatment. Kittens can also have reactions to antibiotics and topical treatments. One example is swollen eyes after administering topical antibiotics to the eye. This may or may not accompany the sneezing. 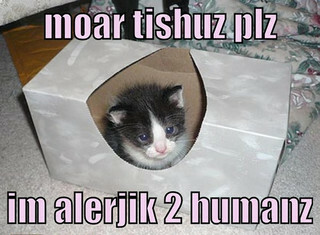 Allergy Kitten has a theory. Other allergic reactions can be caused by the dust in cat litter, reusing items that came in contact with another sick cat recently, a change in food type or water quality, or contact with herbs and spices (even catnip can cause reactions). Think of any changes you made just before you noticed the sneezing. You might be able to pinpoint a change that is causing the reaction and resolve the problem by removing or changing the item. Dental decay is uncommon but possible for kittens and may create the perfect breeding ground for bacteria. Check for swollen gums, bad breath, missing teeth or a discharge coming from the mouth or gums. If you notice any of these symptoms, visit your vet before brushing your kitten’s teeth or applying anything inside the mouth. If you notice any additional symptoms besides sneezing, please check with your veterinarian. You wouldn’t take your car to a hair salon for repair, so don’t try to do your vet’s job. The kitten may need antibiotics, shots or fluids, and there may be other symptoms that were overlooked. Your vet may take X-rays to view the kitten’s nasal cavity or take samples for testing. Some pet owners have suggested putting the kitten alone in the bathroom with hot water running. They believe the heat in the steam will help clear the sinuses. I don’t recommend doing this; the kitten may already be dehydrated and the heat could worsen the condition, as well as pose a possible risk of drowning if the water isn’t draining well enough and the kitten gets into the tub or shower. Some cats do like water, so it’s best to be safe. Check your home and the kitten’s immediate environment, sleeping and play areas for any new items added recently. Wash all bedding, clean all food and water dishes and the litter box, and replace the litter if it appears dusty. Keep the temperature as consistent as possible; extreme heat or cold can further aggravate your kitten’s health. Inform your vet of any signs of illness — even the sneezing — if you have vaccinations or spay/neuter appointments approaching. Vaccinations or operations can weaken the kitten’s immune system and put it at greater risk for increased infection or secondary infections. Don’t skip the appointments — just call the vet to let her know what is going on and explain your kitten’s symptoms. The vet may offer treatment advice over the phone or ask you to bring the kitten in for examination. Let’s hope your little furball is running around like normal in no time.